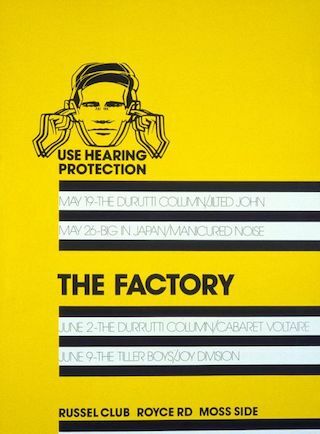 The third evening of Tony (What's On) Wilson's Factory at the Russell Club, Hulme. 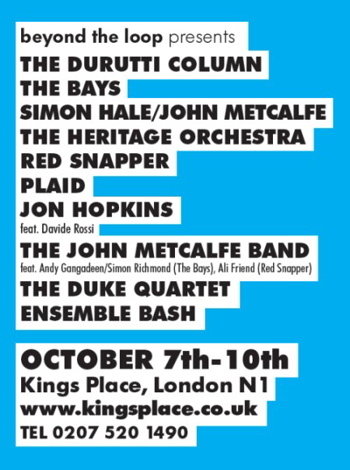 The venue is great, but the sound system is crap and bands suffer for this. 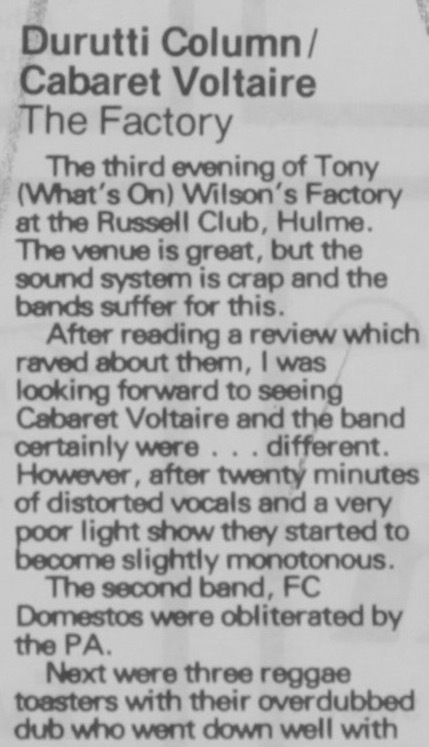 After reading a review which raved about them, I was looking forward to seeing Cabaret Voltaire and band certainly were... different. However, after 20 minutes of distorted vocals and a very poor light show that started to become slightly monotonous. 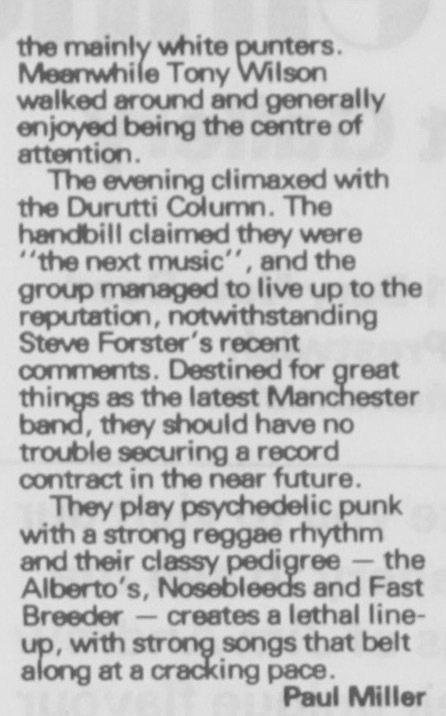 The second band, FC Domestos were obliterated by the PA.
Next were three reggae toasters with their overdubbed dub who went down well with the mainly whiye punters. Meanwhile Tony Wilson walked around and generally enjoyed being the centre of attention. 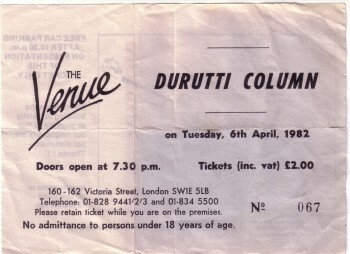 The evening climaxed with the Durutti Column. 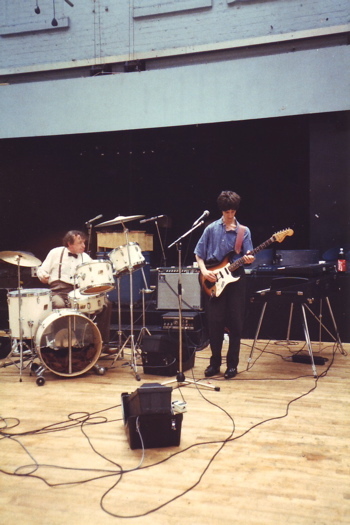 The handbill claimed they were "the next music", and the group managed to live up to the reputation, notwithstanding Steve Forster's recent comments. Destined for great things as the latest Manchester band, they should have no trouble securing a record contract in the near future. They play psychedelic punk with a strong reggae rhythm and their classy pedigree - the Alberto's, Nosebleeds and Fast Breeder - creates a lethal line-up, with strong songs that belt along at a cracking pace.